JORDAN 23 MID TOP TRAINERS. BLACK IN LEATHER/TEXTILE. GOOD OVERALL CONDITION. Nike Air Jordan 1 Mid Black University Red Blue 554724-065 SZ 12 NIB Clippers. Condition is New with box. Shipped with USPS Priority Mail. 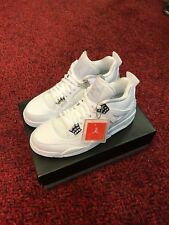 2006 Jordan IV 4 Retro LS Tour Yellow Size 12 Rare Air. Condition is Pre-owned. Remains of a shoe project.100% authentic or your money back. DS 2013 Jordan V 5 Grape 100% Authentic Size 8. Condition is New with box. Shipped with USPS Priority Mail. Jordan why not zero.1 low basketball shoe outfitted with solid gray colorway. Incredibly comfortable and supportive shoe that is lightweight and easy to slide on. Very durable material that will last a long time. Shoe is brand new in box with missing lid, never worn or used. All shoes purchased directly from Nike stores. Red Zip Tie 2017 Nike x Off White. Nike Air Jordan 1 Retro Hi OG BCFC (US10.5) PSG BRAND NEW!! Shoes have only been tried on to see how they feel on, never worn. New Unworn Nike Air Jordan Flight Basketball Trainers. Condition is Used. Nike Air Jordan 1 Retro High OG ROYAL Size 9. Originally purchased from Goat and still in good condition. Does not come with original box. Shipped with USPS Priority Mail. 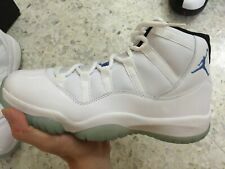 Shoes are Brand New size 11.5 Michael Jordan Gray Sneakers with Box.Checkout my other shoes and hats. Thank you for looking. Jordan 3 Retro Pure White (2018) New with tags Size: 11 Colour: White/White-White Style ID: 136064-111 Condition: New 100% Authentic Jordan 3 Retro Pure White (2018). Condition is New with tags. Sent with Australia Post Pre-Paid Parcel Post Satchel 3kg. Air Jordan 1 Retro Size 9.5. Condition is Pre-owned, (7/10). Shipped in original box with USPS Priority Mail. Nike Air Jordan 1 Low UK 10 Sail/University Gold/Black/Gym Red Condition is New with box. Dispatched with Royal Mail 1st Class. Air Jordan 6 Retro Sport Blue Size 7.5. Very good pre owned condition no creases e.t.c 100% authentic Og receipt included Shipped with USPS Priority Mail. Unten finden Sie eine automatische Übersetzung ins Deutsche. NIKE AIR JORDAN XXXIII. Rückholpolitik: TURNSCHUHE MÜSSEN RÜCKKEHR IN "GANZ NEU IM FELD" ZUSTAND SEIN. den gleichen Zustand wie sie IN den Bildern sind. NEW AIR JORDAN 1 MID TOP 3 BLUE RED BLACK CASUAL SHOE 554724-124 MEN SIZE 7.5. Condition is New with box. Shipped with USPS Priority Mail. Nike Air Jordan Horizon Premium SZ 14 Black Dark Grey Infrared 23 822333-010. Condition is New with box. See images for details, ask questions. If you have a zero rating your bid will be canceled. Shipped with USPS Priority Mail. All sales final and no returns. Air Jordan Lift Off Basketball Shoes. Color: White / White Black - Gym Red. An internal bootie construction pairs with Nike Air cushioning to create a premium performance Jordan silhouette. Condition - new with box, original NIKE.